This year the First Niagara Rochester Fringe Festival presents four free performances in the center of the Rochester’s Downtown district with the STREB Extreme Action Company: SEA. Created by world-renowned choreographer and Rochester native Elizabeth Streb, SEA tests the limits of the human body through a fusion of slam dancing, wild action sport, and falling from height. The STREB Extreme Action Heroes will careen through, around, and above giant, invented hardware, backed by a live DJ and the thumping tunes of some of today’s best beat producers. We asked Elizabeth Streb about SEA, the 30th Anniversary of the STREB Extreme Action Company, and about being back in Rochester, NY. 1. You are originally from Rochester. What do you love most about the Rochester region? Lake Ontario is one of the first things that comes to mind. I also remember Seabreeze Amusement Park was one of my favorite places growing up it was wild and freeing. 2. What does it mean to you to be back in Rochester for the Rochester Fringe Festival? I grew up here and went to Our Lady of Mercy high school in Rochester. I had such a wonderful time there; it’s where I met my best friend Kate Fisher. All the memories here are so deeply imbedded in me. I learned to ride a motorcycle, worked at woolworths as a counter girl, skied at Bristol Mountain, and loved traveling to the Finger Lakes. Rochester is where I started my life experience. 3. The show is called STREB in SEA? What is Singular Extreme Actions? We have been working on this action invention idea based on the belief that humans can fly. SEA cannot really be called dance, though my reputation is in dance. It’s like a monster truck rally combined with bull riding rodeo with some unfussy aesthetics mixed in along with action hardware. SEA represents 30 years of my entire life’s work into a high action performance that draws the audience into the experience. And it can go anywhere, inside or outside. It’s flexible and can be installed into any space. We have performed pieces both indoors and outdoors. Through this experience we are trying to invoke a connection between the STREB Action Company and the community. Trying to erase the line that’s often placed between any audience and the performers. There will be a live local DJ playing music and live cameras that project action images on the buildings adjacent to the performance area. The other live component is you the audience. The audience and kids who have assembled to see the show become part of the show as we intersect our bodies with our action machines. We want to deconstruct and do away with the propriety and the old-fashioned behaviors we have been taught to adhere to when attending a performance and instead get the general audience involved in the moment by dancing, reacting, and participating. 4. What would you tell people about why they should see STREB in SEA Fringe? It’s just one of those things that can’t be put in words. This is a digitally explosive experience. You will not believe what you see bodies can do. You will either be enraptured or terrified, but either way you will be amazed. No one else is doing anything like this. Our performers are falling and landing from 25 feet up in the air. Imagine that there’s abrupt stopping, and slamming, and launching whole bodies up into the air, then spinning rapidly dangerous hardware, all with nine dancers balancing with perfect precision. It feels illegal; it feels irreverent; it feels exhilarating. You don’t want to miss it--this is something you must see it for yourself. 5. 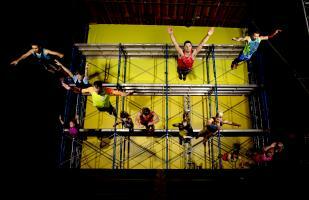 This is the 30th Anniversary of the STREB Action Company—What is something you have learned over these 30 years? I feel extremely privileged for the career and life I’ve had so far and especially for the people I’ve worked with. I showed my first piece when I was 19 at SUNY Brockport, and another when I was 22 in San Francisco, and other when I was 26 in New York City. Then I started the STREB Action Company in 1985. I’ve become so entrenched in the questions that I’ve asked and explored and then this particular inquiry. I always am and have been mystified by time--based events. There is only the now, the irascible present tense event is our ultimate subject. It feels as if I’ve only been doing this for the last 10 seconds. It’s pretty extraordinary that I’ve had this opportunity to work with so many amazing people. I have to thank Susan Meyers, Cathy Einhorn, and Henry Liles. The four of us have made all this possible. And of course: all the dancers I’ve worked with. It’s a phenomenon--there are nine bodies trying to occupy that same spot in space and the very same part of a millisecond. We have a lot of mantras. One is “never land” so in order to not land one must “hit hard.”And have the physical and emotional capacity to pop right back up again. One of the things that separates us from other dance troupes is how we use and explore space. We know how to move within unhabitual places in space and stay outside our comfort zone. Once you get into the air, you are encased in untamable forces that you must navigate. SEA is a wild live event that is replete with impact flight hardware and non predictable physical events. We train for the impact, flight and unpredictable arrangements of human bodies and machines that we call action gizmos. When you watch gymnastics in the Olympics, it is certainly amazing what those athletes can do. They are all soloists. We have a nine person team working together doing these amazing things and trying not to crash. The subject of SEA is action. It doesn’t need music; it doesn’t need story--it speaks for itself. How do we take the viewers’ attention off the body and somehow make them feel they are up there with us? We hit hard, then we get up and do it again. It is the combined relationship of fear and falling and crashing and flight and order and chaos and proportionality and beauty so that the audience might recognize the action., In order to accomplish this we must go fast enough and hard enough for the audience to be caught off guard, for them to actually have an experience because of what we are doing. Our ultimate goal is to make something that will be as powerful as an orchestra performing a great symphony or a singer singing a song of heartbreak or a voice hitting a high ‘C’. I’m always looking for the iambic pentameter of action. We at STREB are trying to construct a grammatically correct order of action events that is capable of taking your breath away. Action is it’s very own thing. Years ago a maintenance man was watching me practice. When I stopped he came up to me and said “the last time I saw movement like that someone yelled ‘grenade.’” That sounds intense, but I want to create a sense of life and death in my art--of what life is. 7. Is there anything else you think people should know? SEA is for every person. You absolutely do not need to know anything about dance to have a truly amazing experience. You will recognize the action if you have ever tripped...banana peel, fallen down a hill, watched slapstick or visited a circus. It is especially great for kids and adults and seniors. It may not be an event for the faint of heart. 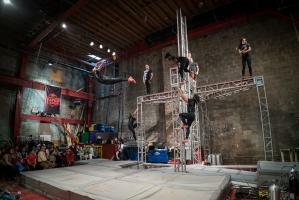 You will want to bring the entire family to see STREB Extreme Action.